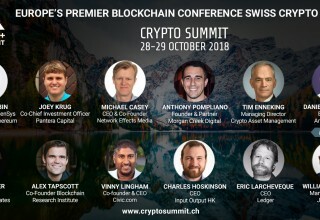 ZUG, Switzerland, October 1, 2018	(Newswire.com) - Crypto Summit 3rd Edition (Oct. 28-29, Zurich, Switzerland) will be dedicated to Crossing the Chasm: Mass Adoption of Blockchain Tech. Europe’s premier blockchain and cryptocurrency conference will pose the all-important question -- where do we stand with mass adoption and what barriers still lie ahead? “Crossing the chasm is not the end, but rather the beginning, of mainstream market development,” Geoffrey A. Moore. During the 3rd Edition of Crypto Summit, this will be a key topic of debate. The most prominent figures in the global crypto space will gather together to discuss whether now, a decade after Bitcoin’s introduction, we’re finally reaching the point of wider acceptance. With the cryptocurrency markets down by almost 65 percent since the beginning of the year, skeptics speak of a bubble, and even some industry insiders are fearful. Yet, under the surface, the crypto industry is booming and expanding like never before. Kahina Van Dyke SVP Business & Corporate Development of Ripple, San Francisco, will be speaking about how Santander is switching its international transfer system to Ripple. This is a leading example of how banks are starting to deploy blockchain tech for settlement and switch to alternative blockchain-based payment systems. Michael Casey, one of the leading minds in the blockchain space, will share his observations on the talent flowing into the space, and other key use cases beyond financial services. And major crypto heavyweight, co-founder of Ethereum and ConsenSys CEO Joseph Lubin will be sharing his insights on building out the Ethereum network and what it’s like to be living in exponential times. “We’ve seen six big bubbles, each more epic than the previous one, and each bubble is astonishing when they’re happening, but when you look back they look like pimples on a chart. With each of these bubbles, we have a tremendous surge of activity, and that’s what we see right now,” Lubin said. Beyond blockchain tech adoption, the conference will zero-in on investment in digital assets. 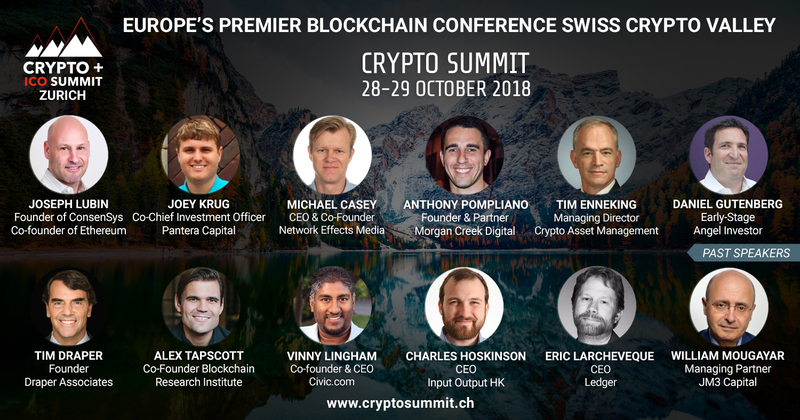 None other than Joey Krug and Paul Veradittakit of Pantera Capital will speak about the new capital formation in the technology space, and Jalak Jobanputra Founder & Managing Partner of FuturePerfect Ventures early-stage VC fund, will also discuss investing and how Switzerland’s Crypto Valley is challenging Silicon Valley, while ICOs are eclipsing traditional VC. Spread out over nine fascinating blocks, attracting delegates, top speakers, and exhibitors from around the world, Crypto Summit has something to offer anyone wanting to learn more about this growing industry. Meet the leading minds in the crypto space and find out just how close to mass adoption blockchain tech really is. Register for your Crypto Summit ticket here. Early Bird Ticket discounts apply until Sept. 30. In its 3rd Edition, the Crypto Summit series produced by Olga Feldmeier has grown into Europe’s premier blockchain and cryptocurrency conference. A twice-yearly event, the March Edition attracted more than 1,400 delegates, with 34,000 tuning into the live stream. The mission of Crypto Summit is to bring together top blockchain influencers, policymakers, investors, and entrepreneurs from around the world.